My last profession - teaching - had this same question as well. So I did a quick survey: My brother has never been asked if it was his calling to be a computer programmer, nor my brother in law a geologist. My sister in law hasn’t been asked at all whether it’s a calling to be in marketing. So I agree .. it’s these female dominated, helping professions that others must demand, “there must be a calling to be good at our jobs.” It’s sickening. Yes: I like the money. Yes: I get paid quite well, and the OT helps push that over. I love my hours, and could never work an 8-4, M-F job again. Working for the state also has its benefits. I’m also good at what I do. It’s not a calling for me - and that’s ok.
Should I feel bad for not picking up extra shifts? OP, all I’m thinking here is “FALL RISK” and other potential liabilities in response to your complaints. All it would take is, “my husband can take me to the bathroom” and boom. Please place yourself in the nurses shoes for a sec. I *have* been a patient on the other side many times. I would never come onto this site and blast the people here, though. It sounds like you’ve already made your complaints to the appropriate people and you’re holding on to a lot of anger. Like another poster said, I think you should speak with someone else to help you make peace with this. Just to add to this discussion ... you see orders like this all the time on psych units. 1mg lorazepam scheduled at HS and 0.5mg lorazepam PRN q4 for anxiety ... zyprexa for increased agitation and then a scheduled order ... Best judgment with the call to the on call is always the best move. I work with a lot of older patients with comorbities and all I think of is respiratory depression with some of them ... in your case, I would have given one PRN and re-assessed, call to the doc if needed. This is why they get paid the big bucks. Never hesitate to call, OP ... it’s always better to clarify. Well ... Do you think you double dosed the patient? Did you have questions RE: the order? I would not have given both doses. The PRN is treating both - sleep and anxiety. Q8 is also key here. I don’t know the patient nor the specifics, but no: one PRN dose should have been given, not both. (raises hand not too energetically) We have a Clark. He was the tech who was going to be “fast bros!” with the psych patient we admitted who was highly agitated but non vocal during his brief ED stay and upon arrival to our unit. So our dumbass let him out of restraints. By himself. No one else in the room. He came running out pretty fast, the actual restraint chair (!!) tossed out after him (kinda tumbled, more like). Patient then hot on his heels. Guess they weren’t going to be bros after all. And here’s me with the IM 5/2 and my other techs I collected coming the opposite direction. You kinda just want to stab the Clark with the IM yourself but ... what a waste. Be like Elsa. The colleague has a problem, not you. Congrats on grad school! I didn’t notice til you just mentioned it. Now I can’t help but notice my name down there. It’s almost like my iPhone telling me how many hours I’ve been on it all week. The shame ... yet, here I am . Would it look bad? Oh yes. Yes it would. What’s an appropriate time of waiting? Preferably, one year. Out of curiosity, what’s the difference in specialties? I think the best training formats have been when meaningful discussion was had. Not when cutesy openers were utilized, or games were played halfway through when I had to work with others to find a conclusion to something ... ... or worse yet, as a group, come up with xyz and how they relate to the specific values of the hospital i.e Integrity, Compassion, Leadership! Especially at the end of a long shift. I showed those values all night long. I don’t envy those in the educator role, truly. But there are times that some educators (not you, necessarily, but in general) have no clue what the target audience actually brings to the table and omg is it frustrating. I’ve had trainers chirp at me about compassion after a shift in which a patient passed on me and I spent a great deal with the family. And then make me do some team building activity on compassion “to make it stick!” ... instead of me sleeping that shift away. It can be so frustrating. I’m a vegetarian. Even by eliminating meat, etc from your diet, you can still eat incredibly poorly (i.e., substituting unhealthy carbs, processed foods). As a nurse, I feel we can provide nutritional advice based on well established guidelines. And if it’s more self limiting, I’ll refer to the RD and educate further based on that. So after being a schoolteacher for years and years and being a nurse for 2+ ... I’ve been exposed to a lot and thought I’ve had a good handle on keeping myself relatively sick-free. When my little darlings in the classroom looked up at me smiling, only to sneeze into my eyeballs ... to those Geri patients coughing and hacking into my smiling face ... at least my teenage kids now cover their mouths when they cough. But I think I’ve caught everything coming my way this year, strong immune system be damned. Bronchitis, then pneumonia ... now I’ve woken up this morning to my fourth cold since November when one nostril is stuffed up and the other is running like a leaky faucet. Good hand washing, vitamins (multi and C), sleep and a good diet has only gotten me so far. Can’t exercise ... since I seem to be always sick. So I’m looking for some tips - what’s worked for you? I’m getting desperate. Thanks, guys. Interesting about the oral care. I do disinfect my phone but my husband doesn’t and then places his phone on my side of the bed when he naps . Someone at work mentioned they started taking elderberry. Anyone hear anything about that? I’m about ready to dance around naked in the moonlight chanting to the goddess of good health, I’m that desperate. Essential oils? Charging crystals in the sunlight? Only have managed one sick day though ... as the bronchitis into pneumonia went into a scheduled vacation. So totally agree with this. You’re certainly going to have your frequent flyers, yes. But I’ve seen my fair share of success stories in inpatient psych too. I’m not in nursing for the calling, and my first career as a teacher wasn’t either. I’m good with where I am, learning every day. I work both neuro ICU and psych; there are days that are rewarding, and days where the shift can’t end soon enough ... but I certainly learn. And I make good money doing it. Bring back our childhood diseases! I’ve typed and deleted several times in response to this article. My response: she’s a twit. She is using her social platform to spread dangerous misinformation on vaccinations. She has most likely never lost anyone to such childhood diseases, nor has known anyone who experienced complications from such “innocent” diseases. Basically, like anyone as associated so closely with the Trump administration, I’m not surprised and 2020 cannot come soon enough. Um, no. I work under my nurse manager. She hired me; she evaluates my performance. We are hired, fired, and managed by other nurses. I operate under a nursing scope of practice, different than a physicians. 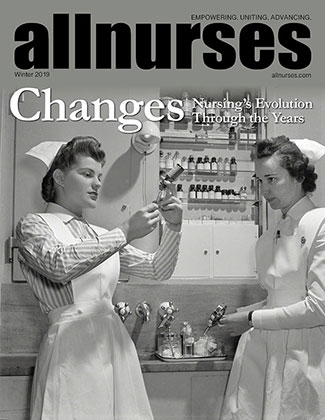 Nursing is clearly an autonomous and distinct scientific discipline. Nursing practice is not defined by physicians. I am in agreement with Rose Queens assessment as I am unclear as to how a CRNA is so unaware of something so basic. Yes, I follow physician orders. That in no way means I work under a physician. They are not related. You mistake a lower level of practical power to subordination. When I first started working on my unit, I had a physician tap me on the shoulder, then demand that I give up my chair to him. Because, “that’s how it should be.” Thank god it was a joke, because the initial look on my face matched the words that were about to come out of my mouth ... words not quite meant to be stated in polite company. Anyway ... Luckily most docs understand that we work with them on my unit. We are not equals, per se. I carry out the orders, but I will damn well question them if I see a safety concern. And I should feel comfortable doing so. By posting here, you are looking for help. You want to feel something different than what you feel now. If that creates a “label” (that is between you and your prescribing physician and/or therapist), isn’t that worth it? You’re stigmatizing yourself before you are even seen. Brain health (a better way of looking at mental health; it’s more encompassing) is just as important as everything else, and you need to take care of it. I’m a stronger person today than I was 12 years ago - before I was diagnosed with that “label.” But the label doesn’t define who I am. Not even close. And the medications that I take, and the self-care that I ensure I do, make me a better nurse. I might implode if so didn’t ensure good brain health. And you might too. So take care of it. It’s the only one you have. So many good points: we don’t have the “healthy rituals” that helped our ancestors cope, but like Viva stated so beautifully in her post our fast paced society expects people to hide away our grief too soon. I feel like we can often be alone in our grief, especially when it hits us so suddenly 6 months away the event, or two years. Or 5. I have actually seen the reverse in nursing, where coworkers have come back from their grief so gracefully that I am almost moved to tears. With myself, I’ve used work as an escape from grief. I think if someone is truly “slacking” 3-5 years after the fact, something else may be going on. This could be a personality trait that has always been inherent, grief or not. But I haven’t experienced such devastating loss and am unwilling to pass judgment. What's up with this RN? Several of my notes were used in court for a patient. In this particular case (combo med/psych), I used “this writer was notified of ...” in the beginning of one of my notes RE: a particular violent night (multiple restraints, multiple de-escalation techniques, etc that failed, a staff injury, etc). I was taught this way, and at 0300, 4 hours past my scheduled departure time I was trying to be thorough and detailed but I was exhausted. The hospital lawyer seemed fine with it? It appears by your two posts that the point of this article sailed right by you. Biological or not - it’s still domestic VIOLENCE. It’s still abuse. Not a spat or fight. We as a society tend to minimize it (aeb the newspaper article Ruby quoted and the words you posted in this very thread) and as health providers we can not. I work with people who have had strokes, developed seizures and have TBIs. My husband received a TBI 6 years ago. None have developed that capacity for violence Ruby is describing. Like Tenebrae said, it is not an excuse to put your hands on someone. How do you give notice? Depends greatly on the type of relationship you have with your nurse manager(s), and the type of impression you want to leave. I did as you stated in the first paragraph with my first psych job. I truly enjoyed working there but wanted to branch out. I was invited to stay per diem, which I have done for the last year. I recently left my second per diem ED psych job (I work FT neuro ICU btw). It was a difficult place to work; I hardly saw the NM nor the 2 assistant NM and did not feel valued. Nurses hated to be rotated to the psych pod, and it made working there much more difficult for me. Since I rarely saw a NM I emailed my letter. So it all depends. If I were to leave my FT neuro gig in the future I’d do so in person as I do feel valued and respected; I’d treat them likewise. They’ve taught me a great deal. But that’s just me.